Place your order securely online or call us. Among G. Harvey's most popular images are those of Washington, D.C. The expanse of Pennsylvania Avenue with the Capitol silhouetted at its end and the hustle-bustle of one of the most beautiful cities in the country, make Vendors on the Avenue particularly appealing. Flower vendors and pedestrians crowd the sidewalks and the casual tourist can enjoy it all. Vendors on the Avenue copyright© 2006 by G. Harvey is prohibited from being copied. All applicable copyright© laws apply and are reserved by G. Harvey. Web pages copyright© 1998-2015 by Christ-Centered Art. All Rights Reserved. 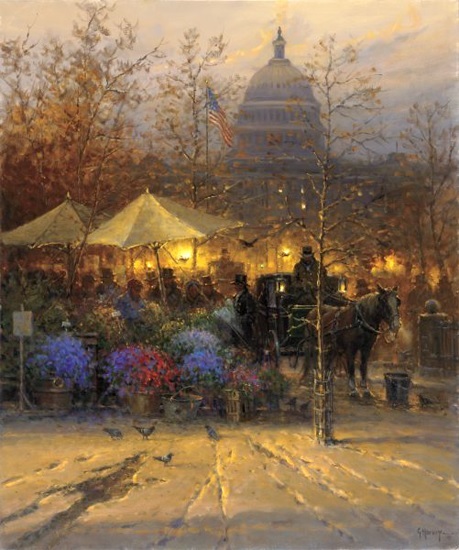 G. Harvey art, cityscapes, Washington dc, pennsylvania ave, capitol, us capitol, cityscape, nostalgia, artwork, art work, canvases, images, paintings, pictures, and prints of Vendors on the Avenue by artist G. Harvey for sale. Vendors on the Avenue painting by artist G. Harvey can be purchased in art print or canvas form at special sale prices at Christ-Centered Art.